Indonesia's presidential elections: What's at stake? 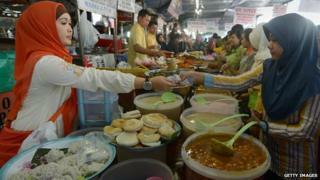 Image caption What's on the menu for Indonesian voters in this month's election? The world's third largest democracy, Indonesia, is going to the polls on 9 July. These presidential elections could determine whether the world's fourth most populous nation will continue to grow in a "virtuous circle" or end up spiralling downwards in a "vicious circle". A virtuous circle is when a country grows and accumulates savings that become investment funds which boost capital and growth. More growth means more income and savings, which in turn means more capital that supports growth. The opposite of this is a vicious circle. That happens when a country is poor, and it doesn't generate enough money for savings, since most income is consumed. Lacking funds for investment, capital can't be accumulated and growth is slow. Slow growth means poor income growth and therefore few funds for saving and thus not much more investment and growth. The key is whether Indonesia can transform its economic growth from one that is driven by the boom in commodity prices into one based on the sustainable expansion of its new middle class. In other words, if the virtuous circle was kick-started by the global commodity boom, then can it be sustained once that boom ends? The danger is that Indonesia could fall into a vicious circle. After all, half of all households are still clustered around the poverty line, so there is a risk of a lack of savings for investment. As Indonesia's finance minister Muhamad Chatib Basri told me, Indonesia needs to grow by 7% to reduce poverty and create jobs. But, that requires investment to be 37% of GDP. National savings stand at (a pretty impressive) 32% of GDP, so the difference must come from foreign investment. Attracting foreign investment equivalent to five percentage points of GDP requires getting the basic infrastructure right. As I said in my blog on Monday, traffic jams in Jakarta alone are estimated to cost a sizeable 0.6% of Indonesia's GDP. But fuel is cheap. A litre of petrol costs just $0.50 or 30 pence. That's because 27% of the 2014 budget is spent on fuel subsidies. The bill for that is 210.73 trillion rupiah ($18.2bn), which is more than the 206 trillion rupiah intended for all capital expenditure, including spending on improving infrastructure. It is a political hot potato, as raising fuel costs would add to inflation and squeeze incomes for an emerging economy with a newly formed middle class. But both presidential contenders have vowed to cut the subsidy. Joko "Jokowi" Widodo has vowed to eliminate it, while Prabowo Subianto - an ex-general and son-in-law of former Indonesian dictator Suharto - would reduce it. Of course, the money spent on fuel subsidies is not the only constraint. Indonesia struggles with corruption and getting the business environment right. But, if it can succeed with these basics, then it has a huge potential domestic market of nearly 240 million people. That's about the size of the US in 1980, when it was the main engine of global economic growth. Driving the whole world economy would be hard for Indonesia to achieve. But, if foreign investment could be encouraged to continue to pour into the country, even with the end of the commodity boom, and was invested in consumer goods and production, then that could provide much-needed investment funds and be the catalyst to maintain the virtuous circle. Otherwise, a shortfall in investment and savings could mean slower growth that plunges households back into poverty. And Indonesia could wind up in a vicious, rather than virtuous, circle. Getting the policies right on the business climate will be crucial for the country. There's a lot at stake with the upcoming presidential elections.